This Kyoto restaurant specializing in Kaiseki/Kyo Ryori(Kyoto Cuisine) is located in a busy shopping area near Kawaramachi Station. Opened in 1912, Kikunoi continues to deliver authentic Japanese cuisine to Kyoto. The original restaurant is located in a spacious area near Koudai-ji Temple. Meanwhile, Roan Kikunoi is located near a station, providing for very convenient access. The clean and fresh wood adorning the inside of the restaurants sets the tone for the traditional Japanese atmosphere they provide. When sitting at the counter seats you can see the skills of the chefs as they work together to prepare the cuisine right before your eyes. In addition, Roan Kikunoi allows you to experience the four seasons of Japan and Kyoto. This experience starts with the seasonal ingredients used for each season and extends even to the flowers, cookware, and hanging scrolls used to decorate the restaurant. Each item on the menu is delicious as well as delightful in appearance. They fully utilize the flavors of each ingredient in their own unique way to provide you with flavors the likes of which you have never experienced before. The restaurant’s owner describes the Kaiseki/Kyo Ryori(Kyoto Cuisine) provided as “an amusement park for adults.” You can only enjoy an experience like this here. Their cuisine provides not only an amazing flavor, but a fun experience. *Reservations must be made prior to your arrival. A hotel concierge will be able to assist you with reservations. The dishes vary according to price and season. 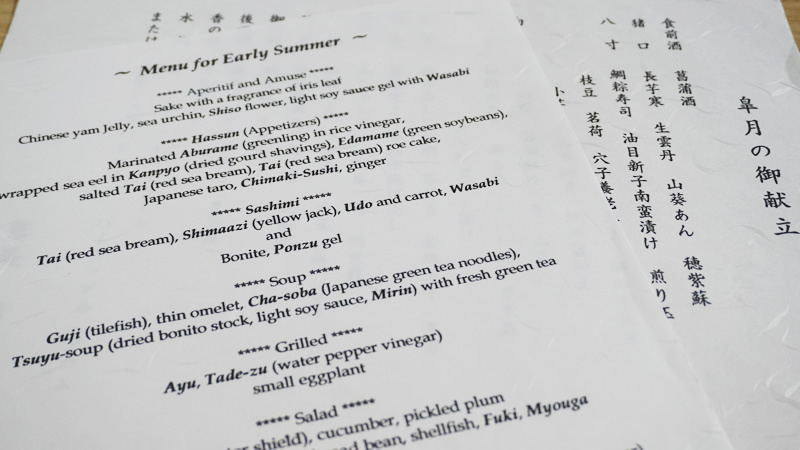 The 20,000 yen course includes an aperitif, approximately 12 dishes, and one desert. Each course will employ seasonal ingredients for you to enjoy. They focus on making the best use of the natural flavors of the ingredients, while also using high quality dashi (Japanese fish stock). Experience their originality through their arrangement of the ingredients, allowing you to individually enjoy each of the dishes at Roan Kikunoi. They are eager for you to experience the beauty of each dish. Drink / Sake ￥1,000～│Plum Wine ￥600 │ Glass Wine ￥1,000 │ Bottle Wine ￥5,000～ etc. They have a number of drinks that match the delicious cuisine. I recommend Kikunoi, their own original brand of junmai daiginjo（pure and no alchohol added）sake. It is refreshing and smooth, with a fruity scent. The Plum Wine is not too sweet, and carries with it the slightly sour flavor of plums. The best way to enjoy the natural flavor of the plums is to drink it on the rocks. If you are unsure what drink to select, feel free to ask the staff, who will provide you with a great drink recommendation. The chefs are directly in front of you when you sit at the counter seats. They encourage you to ask if you have any questions about the cuisine, the ingredients, or how to eat any item off the menu. Some of the chefs speak English and are able to provide you with a simple and helpful explanation. They can even provide you an explanation using photographs. Make sure to be proactive and use this wonderful opportunity to ask any questions you may have regarding Japanese food or Japanese ingredients. The ingredients in each course change monthly. You are provided a sheet with the daily ingredients listed in English The drink menu is only available in Japanese. Please ask the staff if there is anything you are unsure about. When making a reservation, please tell them which course you will be having. Please also inform them at that time of any ingredients you do not like or are allergic to. Roan Kikunoi is a seasoned restaurant with many years of experience in Kyoto, allowing you to enjoy the soul of Japanese cuisine. I recommend sitting at the counter if your group consists of one or two guests. There is an allure to watching the chefs prepare your food while in close communication. It is like sitting near the stage to watch a play where fine, exquisite cuisine is born. If you arrive with a larger group, you can enjoy a traditional dining experience in a Japanese-style room lined with tatami mats. Experience luxurious Japanese cuisine in a unique space at Roan Kikunoi! Please make sure to make prior reservations. Your hotel concierge will be able to assist you with the reservations. Open daily except otherwise noticed. * Closed for New Year's holidays. Please refrain from applying cologne or perfume before arriving at this restaurant. Many people from around the world dine at this restaurant. English menus are available and some of the staff can also speak English.